My sister would have turned 50 today. Alcoholism and drug addiction killed her 8 years ago, after a decades-long struggle to reclaim her life. As a little kid she desperately wanted to be liked, to fit in. She’d come home from her early grades of elementary school crying that she had no friends. For a while she found belonging in softball. Our family all went to her games to support her. At some point she failed to make the team, which was devastating for her. Around the same time, at about age 14, as far as I know her history, a friend shared a stolen bottle of wine with her behind the local movie theater. I don’t think she ever stopped drinking after that, except for one time, when she was pregnant with her son. She stayed clean and sober during her whole pregnancy. Aside from then, from 14 to 42 were hard years, and everything was a struggle. She could be nice, fun, and caring. As adults we got along well, and talked often. I didn’t trust her; she wasn’t trustworthy, but I did like her. As a teenager she stole, both from me and from businesses. She lied about anything and everything. She ditched school regularly, and snuck off to surf with her cool friends. It was a huge crisis for her when she didn’t have the “in” jeans (Salt Of The Earth, in red) one year. She was dragged home, drunk, by the police. Once she and a friend ground up and snorted aspirin (to look like coke) at the beach so they could look cool in front of boys they liked. She would do anything to belong, be liked, and be cool. She drove, of course. The “don’t drink and drive” message doesn’t work on alcoholics. They have to drink, and they have to drive. They have to get to work (or they’ll lose their jobs), to the grocery store (or they’ll lose their kids), and to treatment (or they’ll lose their jobs or go to jail). People ask why we didn’t take her car away. You know what they call people who take other people’s cars? Felons. You can’t just steal someone’s car because you know they shouldn’t be driving. I had a talk with her about a year before she died, appealing to her medical sensibilities. She had a disease that made it unsafe for her to drive. She couldn’t not drink, just like someone with a seizure disorder can’t just stop having seizures, so she should not be driving. She should move to a place where she could use public transportation, and get rid of her car. That seemed to reach her – she saw the logic in it, and she was moving in that direction when she died. Maybe we need support for these people, like free bus passes, or taxi vouchers. Admonishing them not to drive just doesn’t work. My sister was a knowledgeable and talented nurse, employed and respected all of her adult life. She was a charge nurse in ICU, responsible for running whole floors. It was a point of pride with her that she only used drugs they were discarding anyway – she never took drugs from a patient. Eventually she had to limit herself to non-direct patient care positions (like medical help phone hotlines) so she wouldn’t be around drugs at all. It was a fortunate thing that she was in the medical field, because that profession is much better educated about addiction. She was sent to rehab programs over and over, without losing her livelihood. I would go visit her, in 6-month residential programs. She would be journaling, participating in group therapy, walking and working out, eating healthy foods – really putting her heart into the program. She would be enthusiastic and positive, and when she got out she was going to make it work this time, really she was! And then on the way home she’d steal a bottle of whatever she could get her hands on, and be wasted within hours of being released. If you think addicts and alcoholics are merely low-life scum with no brains and fewer morals, who deserve the life they have for drinking or using drugs, then I’m here to tell you that you are wrong. Arrogant, ignorant, and wrong. It’s a mental illness. In the right circumstances, it could happen to you or someone you love. I hope it doesn’t. It’s hell for the addict and everyone around them. Still think addicts should just stop? Tell me, how’s that diet going? Still smoking? Working out regularly like you know you should? Trying to cut back on sodas? Yeah… Glass houses, and all that. Try not breathing for a while. That’s how she described trying to stay clean. She simply could not do it. It’s true that only the addict can make the choice to get clean. Nobody can do it for them. But it’s also true that sometimes even they can’t do it. They can try and try, and still fail. What I’ve seen more than addicts or alcoholics being “losers” is that they are sweet, gentle, sensitive people. In my experience they are kind, caring, and helpful. They want to be accepted and loved. We all do, but I think it’s a stronger need for them, to the point they will destroy themselves to get approval from others. We need to take the shame out of alcoholism and addiction. It’s something that’s gone very wrong in a person’s brain, like any other mental illness. When something is shameful, people feel they need to hide it. How can anyone ask for support and get help if they can’t let anyone find out they have a problem? They are damned if they do ask for help, and damned if they don’t. We need to remember that they are people in need of help. They say “talk to your kids about drugs and alcohol,” but I think we need to go deeper than that with kids. Get ahead of that, and talk to them about keeping their own integrity, being true to themselves, and not being so concerned with what others think of them. Teach them to trust their own good sense, and value their own opinion of themselves. Teach them that anyone who would encourage them to do something wrong or stupid isn’t their friend – isn’t worthy of their friendship. Teach them that having only one or two good friends, or no friends at all, is better than belonging to a group of the wrong people, however awesome they might seem. Of course teach them how to say no. But so much more important to teach them to be OK standing on their own. Help them find belonging and community in positive ways. In my experience the lesson barn and the martial arts dojo are two very good options. If you are a very young person reading this, please don’t try addictive drugs or drink – at least not until you are well into your 20s. Not even once. Your brain isn’t ready to deal with it. You might make the choice freely the first time, but after that it might not be up to you, ever again. Some people just get hooked. If you are one of them, you are screwed, possibly for life, which may be very short and very unhappy. Don’t take the risk. If all your friends are doing it, find new friends. If all the cool kids are doing it, be uncool. Loneliness and the scorn of the in crowd won’t kill you. Really, it won’t. Drugs might. 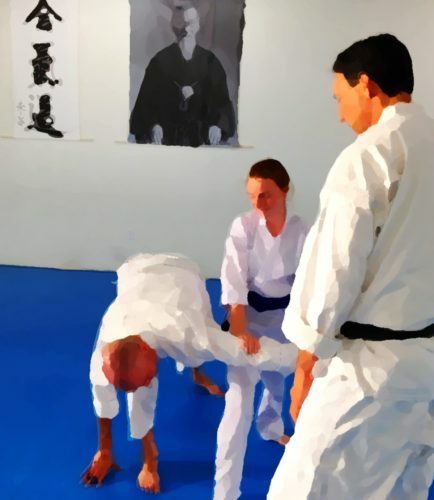 Listen: “Aikido, Empathy, and Neurodiversity” with Sensei Nick Walker, M.A.